-We'll take female or male. -Age is not a factor (We're not ageist either ). - *Please no high necked shirts or glasses. -Please no inappropriate (lack of) clothing, poses or gestures (Keeping it PG would be great). - *Camera photos - none of this "I took it with my webcam or my cellphone" ridiculousness. - *Sharp photos. Same as above. -*Preferably, taken in daylight, between noon and 4pm. This last bit is not necessary but it would be a huge help to us. There is no deadline for when we need these pictures turned in, but it would be nice to have collected them before January is out. Also, you'll get credit for being kind enough to lend your beautiful lil' face to our pack! And we'll greatly appreciate it! Just post up your picture here, or Pm'it to Enkida or me*, and we'll get to work on it. If you have any questions, just post'em here! Edited by Enkida, 10 January 2012 - 10:21 AM. This is just a brilliant idea ! Great idea. Can you add some elven portaits as well, or is it contrary to the goals of the pack? I don't want to use the Xan portait for my wild mage elf, nor do the ones in the NSC portaits are really fitting for my planned PC. So far the projected scope of our project is to have a minumum of 75 portraits of both genders, all BG2-playable races, and a wide variety of real world ethnicities. There will also be a smattering of non-canon races, like drow or vampires, though these will really only be a small part of the overall pack. I haven't been counting but at my last check I think about 20 portraits were already done, perhaps a few more than that. What there will not be a lot of is caucasian portraiture, aside from what self-photography caucasian BG players may contribute to the project, plus some extra pre-project portraits we both had lying around. 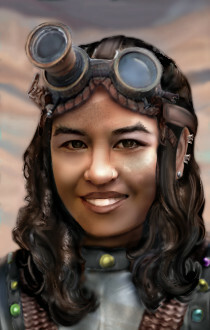 The portraits are to celebrate ethnicity, both real world and Faerun races, so that is our primary focus. So in short, yes, there are already elves. And humans. And halflings. And gnomes. And half orcs. And dwarves. Of both genders. Edited by Enkida, 13 January 2012 - 11:00 AM. I don't suppose you'd be interested in pictures of other people? That is, pictures that aren't of BG players but who might be good portrait candidates, that we've either taken ourselves or found on the web? If so, I think I have a few good ones lying around. Hmm, well that depends on the picture. I'm always on the lookout for good models for the NPC portrait pack stuff. However - I personally like to stick to either stock photography or famous celebrities for two main reasons: the celebrities market their images, and indeed have their images reused all the time by fans, often with their blessings, as part of their job description, so it's semi-acceptable to see famous people flooding the fanart market. Except for poor Jude Law, who must be sick of being the frontman of the Baldur's Gate modding world by now, LOL. If you just find "good pictures on the web" there's a chance that there is some free use or copyright issues involved. I know, I know. 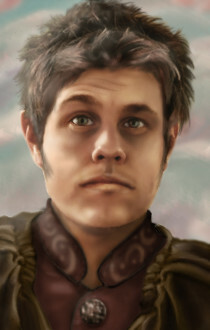 Ethics play practically a negative role in the Baldur's Gate portrait modding community, so don't let my hangups stop you from trying to get your pictures Baldurdized even if they don't meet my personal criteria. I do know there are some other people here who are currently trying to do their own portrait packs, so there is a chance you might get pictures of even dubious origin baldurdized. Edited by Sanctifer, 18 January 2012 - 12:04 PM. I think I'd make a pretty good gnome. You know as much I love that picture, I am sure it's not your own. ;-) Seriously, only self portraits please, just to avoid free use issues. Edited by Enkida, 16 February 2012 - 02:31 AM. I can make a self picture - mainly for a elf fighter/mage or kenasi. I can definitely take a picture of myself holding a longsword in frame, and have it looking very cool as well. I sent Enkida a PM about this, by the way. Is this still going on? Its been over a year since the project was announced... I'd be willing to contribute if the holdup is due to not having enough volunteers. Always in the market for nice PC portraits and I'm a big fan of yours and MiLeah's work. Last I heard Enkida was pregnant and decided to take a break from internet-land (This was back in late 2012). I do believe she had a healthy little boy, but I haven't heard from her since. EDIT: Nnnnarp, I've just realized that it's wrong to hijack this topic in the way that I just did. Instead I'll make a new topic regarding my project that I've been working on, instead of bumping this topic and giving people false hope that this specific project is alive and well when it sadly just isn't. Edited by MiLeah, 11 April 2013 - 10:08 PM.